Can you feel that good feeling settling in? Spring is coming to wipe away the miserable memories of winter. 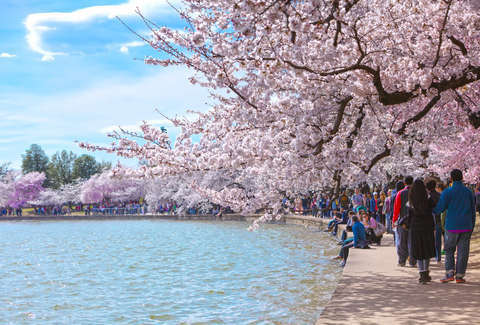 This side of free ice cream, a walk under cherry blossoms, or the first day of t-shirt weather, a trip out of time is the best way to welcome the warming weather. Right now, you can dig up a $20 one-way flight in Frontier Airline's spring sale. Purchase your trip by midnight on March 20 for a flight taken by April 17 and you'll find round-trip flights for as little as $38.60. You'll find 36 routes at the $20 price point out of cities like Atlanta, Birmingham, Charlotte, Denver, Huntsville, Jacksonville, Lafayette, Las Vegas, Little Rock, Nashville, New Orleans, Omaha, Orlando, Saint Louis, San Antonio, San Francisco, Sarasota, Sioux Falls, Tampa, Trenton, Tulsa, and Wichita. Plus there are more than 100 routes with tickets for less than $50. Though the flights are cheap, its worth noting that the employees might not be the happiest right now. A multi-year contract dispute is coming to a head at the moment. Flight attendants for the budget airline are among the lowest paid in the industry, and their union, the Association of Flight Attendants-CWA, has been in contract negotiations with Frontier since 2016, per a report from New York Magazine. In November, 99% of union members voted to authorize a strike if progress isn't made soon. If you are flying Frontier, it's absolutely possible to get a cheap flight. However, it's wise to get the full picture on the price before you complete your purchase. The airline charges extra for seat selection and luggage. Though, you can skirt the seat charges if you have your seat assigned to you at the airport. Despite the potential for extra little fees, you can get a low-cost trip for an unexpected spring break. And that might be the best kind of spring break.